* USB Interface adapter for all CARVEC products including the G-Lock, Signal-Master and upcoming brushless motor drive modules. * Compatible with the Freefly Radian. 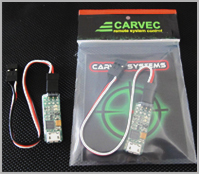 The CARVEC USB adapter is a very small USB to Serial port adapter based on an FTDI chipset : the most robust and reliable interface we have found. The FTDI supplied drivers make it compatible with virtually all operating systems.